Founded in 2009, the Houston, Texas-based company NanoRacks LLC provides commercial hardware and services onboard the International Space Station (ISS) for government and commercial customers. To date, the firm has sent more than 550 payloads from over 30 countries to ISS, creating trends in commercial hardware in space. In an interview with Astrowatch.net, Jeffrey Manber, the founder and CEO of NanoRacks, talks about the company's future and past achievements. Astrowatch.net: What are you future plans for the company? What is your priority for the coming years? Jeffrey Manber: We are growing into the world's first commercial space station company. Today, our focus is on completing our commercial airlock on the ISS, which will allow far larger satellites and cargo to be deployed from the station. We are also moving forward on re-use of existing in-space hardware for commercial habitats and marketing other real estate in space, such as Blue Origin's suborbital New Shepard platform. We want to be the market leader in owning or operating as much real estate in space, from low-earth orbit to deep space to the moon and Mars, as is commercially possible. Astrowatch.net: Your company is involved in many projects onboard the ISS. Could we call NanoRacks a trend setter when it comes to developing commercial hardware on ISS? Manber: I would like to think that is correct. We were first to market on the station in owning and marketing our own hardware. We were first to have non-U.S. customers, first to have commercial satellite customers using the space station and we paved the way for using the space station in myriad commercial projects, from education to basic research to biopharma. Astrowatch.net: How is your cooperation with NASA going? Do you plan some projects involving other space agencies? Manber: Great question. The relationship with NASA has matured in many ways. NASA and the space station program office no longer question whether companies can and should make a profit providing services on the station using their own hardware. The space station office now supports our new projects, such as airlock, where we are self-funding. So the partnership with NASA has matured. They are at times a customer, they are our regulator and they are our landlord. Just as it should be in a commercial relationship! We have very good relations with other space agencies. ESA is a customer of ours for satellite deployment. So, too, the European Union Commission. We work extensively within the Japanese module KIBO via the U.S.-Japan barter arrangement, so we have wonderful relations with the Japanese Aerospace Exploration Agency (JAXA) and so too with the Russian Space Agency (Roscosmos), with whom we work on both Progress and Soyuz. NanoRacks is unusual in how deep is our relations with non U.S. space agencies. This is good as we look to return to the moon and move on to Mars. Astrowatch.net: Are commercial space companies the future of spaceflight? Manber: The industry is on the cusp of having space be just another place to do business. We are seeing multiple private launch vehicle efforts, we are seeing government behaving more and more as a customer. We are seeing companies like NanoRacks beginning to look beyond the International Space Station to see a marketplace where there are multiple space stations, all commercial, some unmanned for in-space manufacture, some manned as hotels, some for professionals to train for deep space missions. Astrowatch.net: Which of NanoRacks' products on ISS is the most important for you and why? Which one was the biggest milestone for your company? Manber: Right now our satellite deployment hardware is important because it is a large percentage of our current revenue! 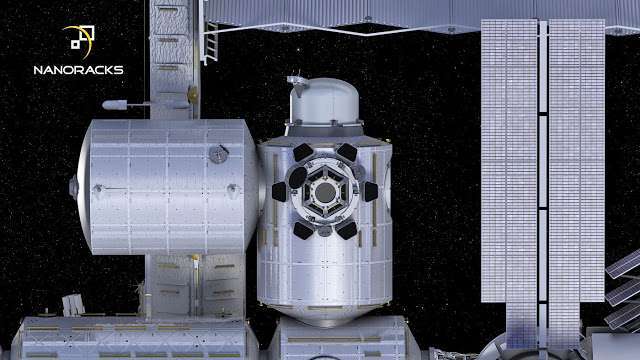 But as we look to the future, the airlock will be key, because not only will it increase our revenue from today for cargo egress and satellite deployment, but at some point in the future, we will remove the airlock from ISS and attach it to our own commercial platform. How cool is that? Oh, I would say our biggest milestone was successful deployment of satellites. Or when we agreed to accept NASA funding for a research hardware called Plate Reader and NASA was nervous because we were new. So we agreed that if Plate Reader did not work, we would refund the taxpayers money. Luckily, it all worked! But I have not seen any other company make that same offer when taking the space agency's funding. But it was a turning point for us when NASA realized we were serious. Astrowatch.net: You have recently made a statement that the company's mission is to democratize access to space. How close to achieving this goal is NanoRacks? Manber: It is fair to say that after 550 payloads in seven years of operations from over 30 nations, including high schools and new nations to space, that after stimulating the growth of an entire new market—commercial CubeSats—NanoRacks is today democratizing use of this incredible new frontier. Anyone, anywhere, from China to Vietnam, from Peru to Brooklyn, can and has used NanoRacks to undertake a commercial space research project. We have even had multiple customers whose funding came from crowd sourcing websites. It is a revolution and we are proud to be a leader in realizing this revolution in space utilization. Who knows what will be the situation in just five years?